A luxurious living comes with optimum personalisation of the bathroom. You would like your taste and aptitude to be soundly incorporated into the bathroom designs. 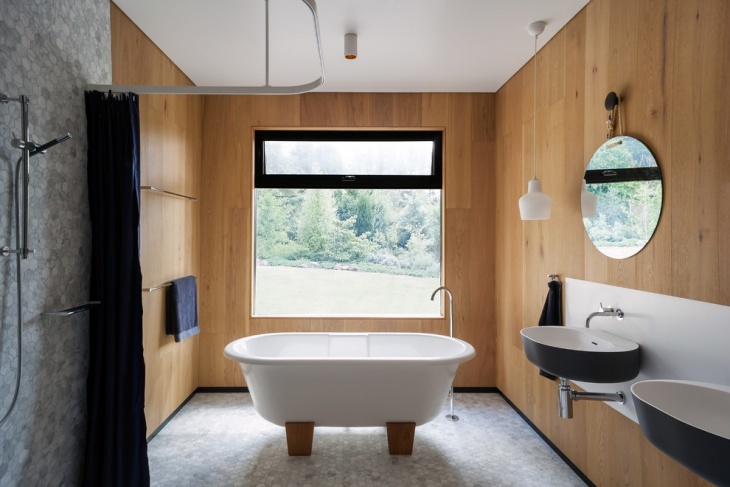 People from different parts of the rely on innovative Chalet Bathroom Ideas to get stunning interior designs for the most private areas of their homes. 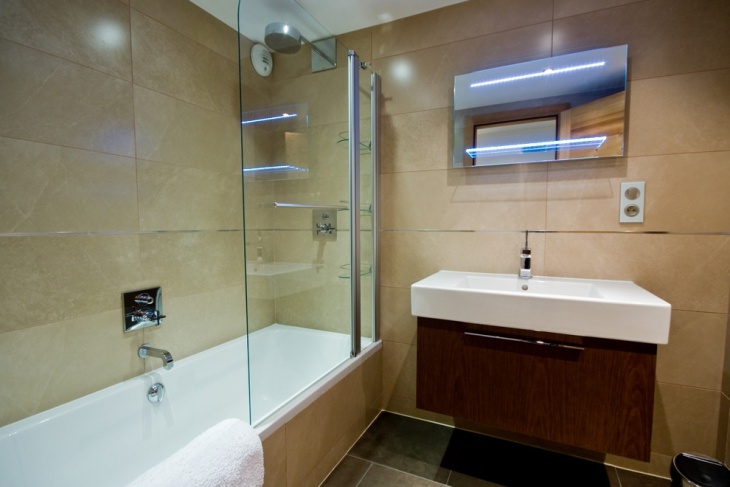 There are different accessories like indoor saunas and bathroom cabinets that can make the space gorgeous. 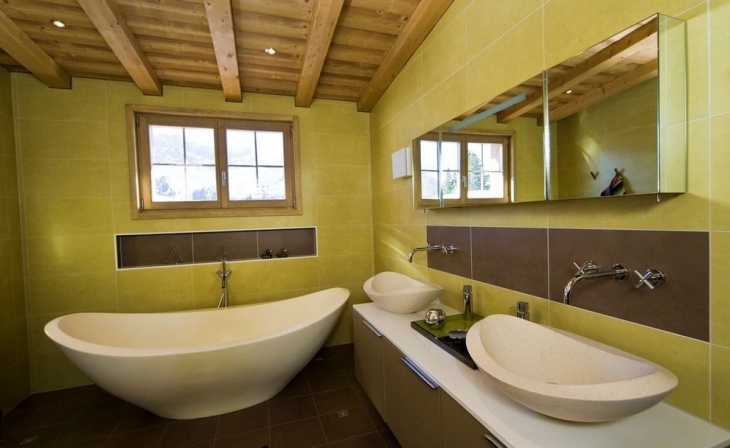 Here are ten classy chalet bathroom design ideas that will live up to your aptitude. 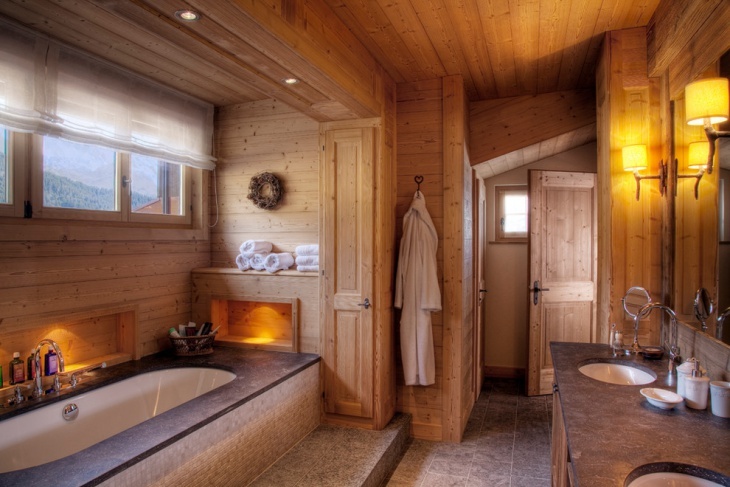 This chalet bathroom design has a great look, with a wooden finish on the walls and ceiling. It has a cabin space and indoor sauna to enjoy the comfort. The bathtub is placed right under the window, and these are ideal for cottages. Fix tiny pendant lights above the bathtub to enhance the elegance of the bathroom. People who crave for luxurious bathrooms focus more on the materials used in the interior. Here, you will find a perfect combination of brown and slate tiles in the bathroom. 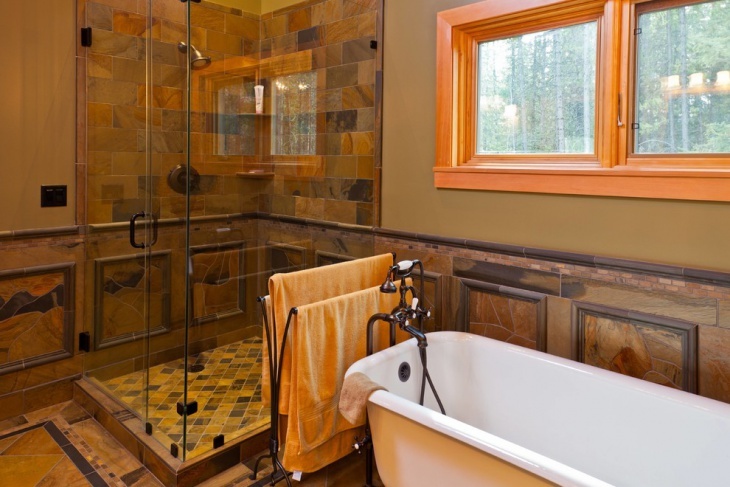 The glass screen is sophisticated and goes well with the brownish-yellow hue of the bathroom. Pave the floor with the brown tiles and paint the window frame in orange to get the matching contrast. This is a Minimalist Bathroom with a long wall mirror. The wooden doors and floors have a great compatibility and light yellow walls make the room bright and beautiful. The frames around the mirror and hooks are matching, which further enhances the look of the bathroom. 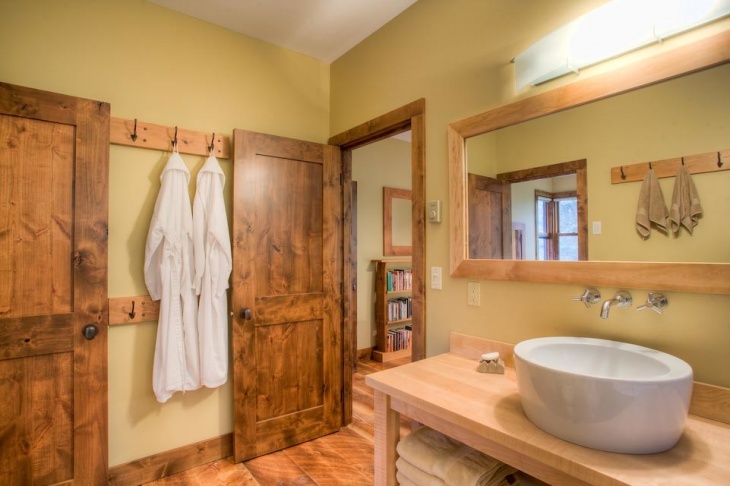 Pine walls, black window frames and plank siding brings a rustic look to the bathroom. Fix some portraits with black frames on the walls, and these will complement the dark window frames. 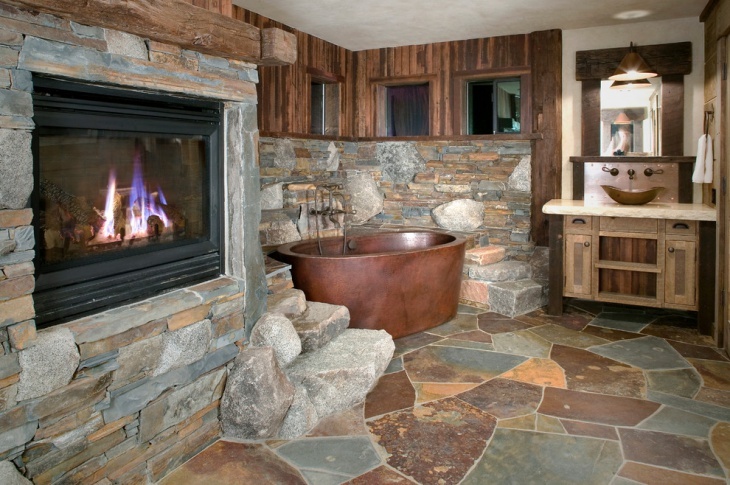 The pedestal tub and elegant sink deliver a rustic outfit to the chalet bathroom. When you look out for a perfect combination of interior materials, you can blend tiles, stones and wood in the right way. The bathroom walls are made of black tiles, that make them grand in appearance. A black stone countertop with white sinks and wooden cabinets below makes the bathroom really classy. This is a contemporary Beach Bathroom with wooden walls and light colored flooring. There are a few accessories in the bathroom, including tub and sink. 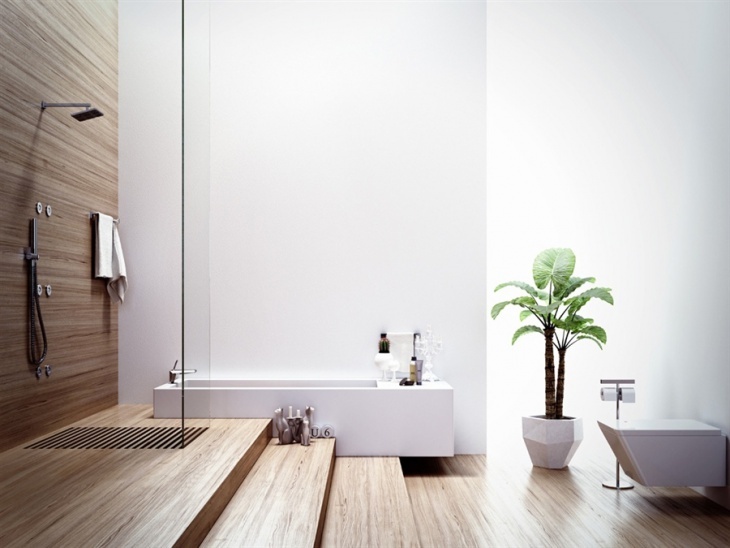 It is a Minimalist Bathroom design with a wide window. The black frame around the window makes it look elegant. People who like to innovate new interior designs for the bathroom can opt for wood-painted panelling in the room. It has a white bathroom with a good contrast of cream and brown. Brownish square floor tiles are ideal for the room. The sink, tub and toilet are placed on three different walls, and there are brown sitting accessories in the bathroom. 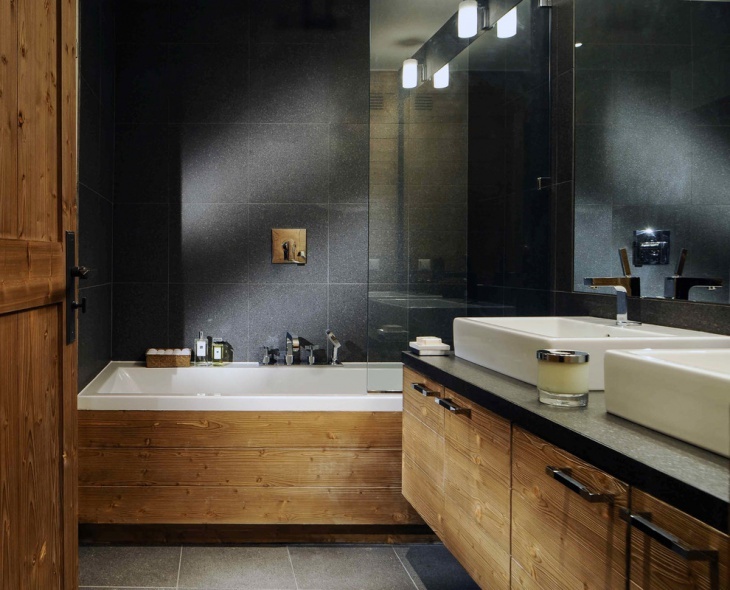 This particular chalet bathroom has dark brown, polished floors and long floor cabinets of the same colour. The countertop has a matching finish and looks great with white sinks fixed all along the length. 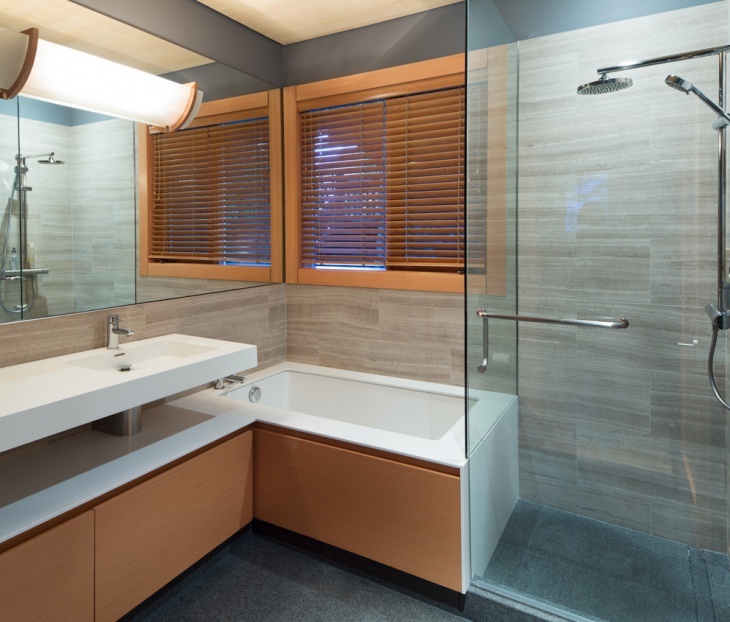 A brown bench and glass shower screen completes the beauty of the bathroom. People having a taste lesser accessories inside the bathroom will prefer this for Minimalist Bathroom design to others. The tub and sinks are artistically made boat-shaped. It has a brown tiled floor, with a matching horizontal strip of brown in the middle of the walls. The lemon green walls go well with the wooden ceiling. 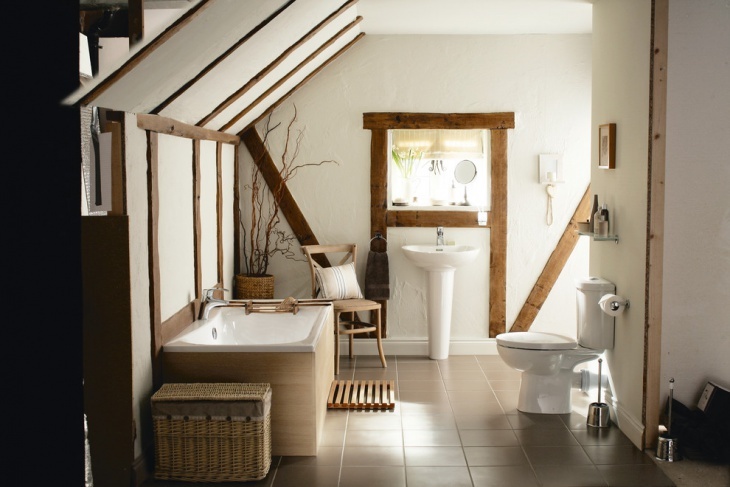 People are experimenting with new Chalet Bathroom Ideas in order to personalise their desired themes for bathrooms. The right choice of wall and floor tiles blends with sophisticated accessories to breathe a cultured ambience in the bathroom. You may have found these ideas helpful, and in case you have something innovative, feel free to share them with us.